I watched Nintendo’s 2015 E3 digital presentations live and not only saw Metroid Prime: Federation Force as it was being unveiled to the world, but I also saw all the negative reactions that people had right after the event. The complaints didn’t stop there – someone actually created a petition to cancel the Metroid spin-offs development. What’s even more surprising is that there are exactly 24,127 supporters (at least as of this writing) of this petition! 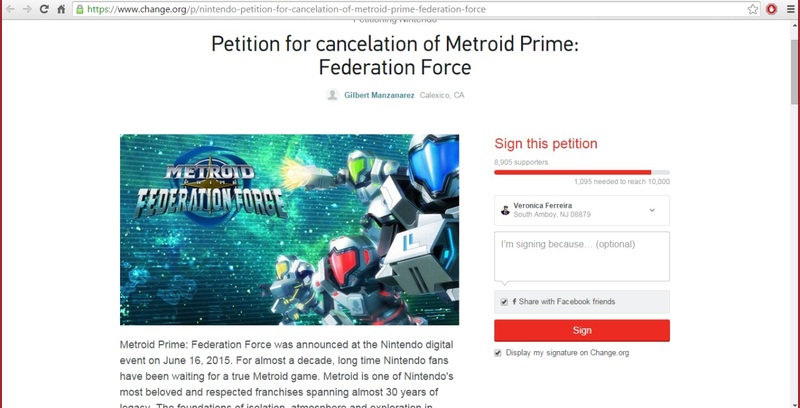 This petition did nothing to stop the development of Metroid Prime: Federation Force. But it’s a good indicator of how much hated this game currently is. Despite having more than double the required supporters, development on the game continued and now, it’s already out in all territories. The game has already been reviewed and has gotten mixed reception. I have a copy of Metroid Prime: Federation Force and while I haven’t been able to play it long enough to do a full review, I can say that it’s not a bad game. That hasn’t changed the general perception of this game, as proven by the low sales numbers in the UK and Japan (and most likely in North America and Australia as well). Is all this hate for the game justified? Or is this a case of fan entitlement getting out of hand? Let me review the common reasons and complaints that I’ve seen on both the petition and in several message boards, forums, and discussions. This complaint depends on which Metroid fan is saying it. The 2D Metroid purist who also did not like the FPS Metroid Prime games has been waiting for another 2D style “Metroidvania” game, and that’s fair – the last time we got this kind of game was when Metroid Fusion was released on the Game Boy Advance back in 2002. The Metroid fan who likes both the 2D and the Metroid Prime games is looking for another Samus-centric solo adventure. Both styles have an emphasis on level exploration and has themes of isolation and mystery. It’s true that Metroid Prime: Federation Force isn’t any of that. But is it fair to close our minds to this spin-off game simply because it’s different from the Metroid games that came before it? This close-mindedness, in my opinion, counters a developer’s desire to innovate and create new experiences. I mean, if Nintendo limited themselves only to what fans want and ask for, would a game like Super Mario Kart ever see the light of day? Were there any fans of the Mario Bros. platformers who asked to see Mario in a kart racing game? Or a tennis game (Mario Tennis)? A golf game (Mario Golf)? A party game (Mario Party)? A puzzle game (Dr. Mario)? Did anyone who liked Super Mario World say “I want to play as Yoshi in the sequel”? Because we got Super Mario World 2: Yoshi’s Island and that was an awesome game. Did anyone ever want to see the characters of The Legend of Zelda in a Dynasty Warriors-style game? I don’t think so, but Nintendo went ahead and made such a game and gave us Hyrule Warriors and Hyrule Warriors Legends. Did anyone ask for a fighting game cross-over between Nintendo’s different properties? Probably not, but Nintendo gave us Smash Bros. and it’s been one of their most popular game franchises since. How will Nintendo take the Metroid franchise to different levels if all fans want is another 2D and/or Prime game? Metroid Prime: Federation Force isn’t a Metroid game – it’s a Metroid spin-off. Nintendo was very clear with that when this title was first announced. It’s a side story, similar to how Persona is to Shin Megami Tensei or how Rogue One is a side movie to the core Star Wars films. So it’s not supposed to be what a Metroid game is. So why hate on a game for not being what it’s not supposed to be? This game is supposed to be a mission-based multiplayer co-op first person shooter for the 3DS. How many of those do we have on the system? I don’t think there are any – IronFall Invasion has multiplayer but it’s mainly free for all or team vs team “deathmatch” modes. Moon Chronicles only has single player campaigns. Resident Evil: Revelations has co-op but is limited to just two players. There is nothing like Metroid Prime: Federation Force for the 3DS right now, so this game does fill a need. And being a multiplayer co-op, of course it won’t have expansive worlds. Can you imagine how long it would take for four people to play a multiplayer game that strictly adheres to the level design of Metroid Prime, a game made for solo play? Metroid is a franchise that is very similar to The Legend of Zelda in that there’s one main protagonist (Samus for the former, Link for the latter) that’s always the “hero”, so I understand why fans would feel bad about not being able to play as Samus in Metroid Prime: Federation Force. It’s like playing a Metal Gear Solid game that doesn’t have Solid Snake! However, there are two big differences in the two franchises that I just mentioned. You can’t play as Samus, but you can paint your mech in the same colors as her armor! The first one is their genres; The Legend of Zelda is fantasy and Metroid Prime is sci fi. The second difference is that, given the fantasy theme, The Legend of Zelda games don’t follow a single continuous storyline – the games actually feature different versions of Link, in different time periods. Link, in the Zelda games, is destined to always wield the Master Sword and always save Hyrule from evil. Metroid, being a sci fi franchise, doesn’t have the same trappings. The Metroid games follow a single continuing storyline, and Samus is not some pre-destined heroine who is the only one who can save the universe. There’s no all-powerful magical “Master Blaster” that only Samus can wield, so other heroes can actually exist in the Metroid universe. This, in my opinion, justifies the storyline of Federation Force: why wouldn’t a technologically advanced society form their own army of enforcers that can fight the same evils that Samus opposes? Umm… so what if the characters are super-deformed? You only see the chibi characters during mission briefings and when they’re out of their mechs. Most of the game is played from a first person perspective inside the mechs, so you won’t see the chibi models all that often. At the end of the day, it’s a matter of taste, but can one seriously say that a game is broken simply because the character models are chibi? It’s true that nobody asked for a Metroid or a Metroid Prime spin-off. But if you take away the Metroid Prime brand, Metroid Prime: Federation Force is simply a multiplayer co-op FPS game. Who doesn’t want that? People play and enjoy games like Overwatch, Gears of War, Counter-Strike: GO, and Call of Duty on other platforms. Before Metroid Prime: Federation Force, there was nothing on the 3DS that provided a similar experience. I’ve been waiting for a game like this ever since getting a 3DS (I don’t own any of the consoles) and I don’t want to buy another console just to get my co-op FPS fix. Giving the game the Metroid brand and linking it to Nintendo’s famed franchise is gravy. Don’t go out declaring that nobody wants a game like this, because you’re stepping on the toes of people like me. I want a multiplayer FPS on the 3DS. This is a complaint that I don’t really get. Why shouldn’t Nintendo brand this as a Metroid game? The FPS mechanics here are different from Splatoon – you actually shoot monsters here and aren’t aiming to cover the majority of the battle arena in your paint colors so this doesn’t fit the Splatoon IP. Federation Force is a mission-based multiplayer FPS with game mechanics that are really similar to what Metroid Prime had. 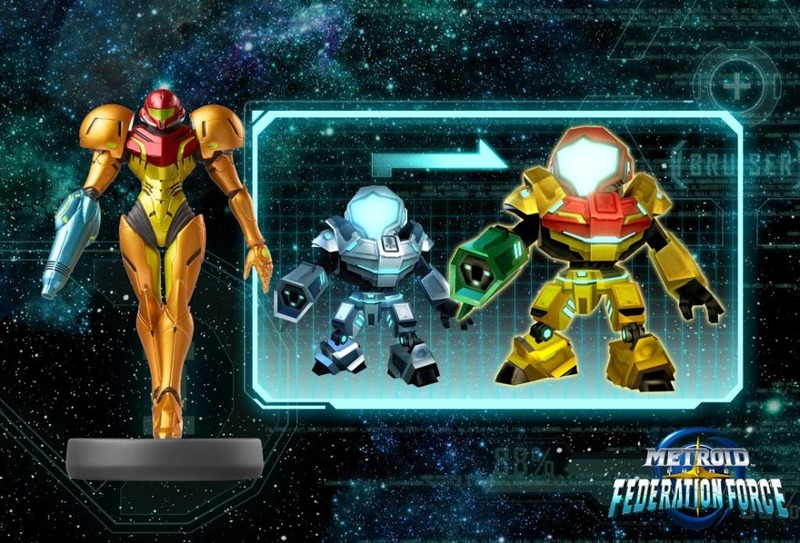 The storyline that Nintendo came up with fits the Metroid universe – again, why wouldn’t the Galactic Federation use their technology to beef up their soldiers so they won’t always have to rely on Samus to save the universe? Why is it so bad for a game like Federation Force to be part of the Metroid story? Is Federation Force tarnishing the legacy of all the Metroid games that came before it? Is this spin-off leading the Metroid franchise into a direction that is so far removed from what the franchise is? I mean, this isn’t the Galactic Federation vs zombies. This game involves intergalactic soldiers who are involved in space battles. Why isn’t that a good fit for Metroid? We don’t really know much about what happens in the background when it comes to game development, but we do know a few things. First, Metroid Prime: Federation Force was developed by Next Level Games; Nintendo simply hired them to do so. So Federation Force didn’t exactly take up the time of Nintendo’s core development team. There are several questions that we can ask just from this. First is, is Nintendo developing a core Metroid game themselves? Nothing has been announced but that doesn’t guarantee that Nintendo isn’t doing anything Metroid related. A lot of factors, the quick death of the Wii U being the biggest one, could have resulted in the lack of any core Metroid games in recent years. The second question is, maybe Metroid Prime: Federation Force was a test for Next Level Games. Do they have the ability to develop a good Metroid game? This could have well been their “audition”. If the latter speculation is true, that Federation Force was Next Level Games’ ticket to making a core Metroid game, do you think that Nintendo would give them the go signal? Going back to the complaint – Nintendo didn’t use their internal resources for Metroid Prime: Federation Force. And as far as Next Level Games is concerned, are fans willing to have a third party developer handle after Metroid: Other M (which was developed by Project M, a group that consisted of internal and external developers)? Again, we don’t know much about what transpired and what’s currently happening behind the scenes. With all that said, I’m a little disappointed in the Metroid fanbase – at least the part that closed their minds off to a spin-off. It’s a decent game that’s gotten positive reviews, but was essentially “dead on arrival” because of them. If Metroid Prime: Federation Force simply didn’t interest you enough, that’s fair. People shouldn’t buy games simply because they’re fans of a franchise. But to completely ignore what it has to offer just because you were expecting something else is just sad. What I’m really worried about now is how the Nintendo shareholders are going to interpret these low sales figures. Will they understand the message of “We want a core Metroid game and not a spin-off” that the Metroid fanbase wants to convey, or the incorrect idea of “No one wants to buy any more Metroid games”? If it’s the latter, then this might very well be the last Metroid game that we’ll see in the next couple of years, which is a shame. What do you think about Metroid Prime: Federation Force and all the hate that surrounds it? Am I wrong for wanting to defend the game? Let us know what you think by leaving a comment or two below! I enjoyed reading this. I do feel like FF has been unfairly hated, and most of that is not even because gamers dislike the game. It’s the fans taking out their frustration at the lack of a real Metroid game since Prime 3 (and even Other M) made their debut years ago. If FF was announced in addition to real Metroid game, I’d even wager that people would really enjoy and be open to it. It’s just unfortunate, really. Thanks for the comment! I agree, it truly is unfortunate that this game is being unfairly judged by a lot of people. Not all – I know that there are those who are open-minded enough to look at what Federation Force has to offer and co-op FPS games simply aren’t for them or they expect more.